We know that to hear the words “root canal” makes some people nervous. Please don’t be! The technologies developed in the last few years make this procedure painless and much quicker than in the past. We are happy to talk to you about what to expect. 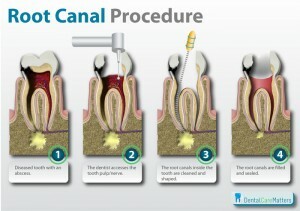 Root Canal Therapy is called Endodontics (inside the tooth). It is necessary when decay has invaded the nerve of the tooth. It is also recommended when we need to utilize the root space of a tooth to properly fix a tooth. A root canal can save your tooth so it does not need to be removed. We access the inside of the tooth just like doing a filling (using numbing! ), the inside is gently cleaned using special instruments and then sealed so it will not get re-infected. It is important to make sure the tooth is strong after a root canal so we usually recommend a crown to protect the tooth for the best long term result.